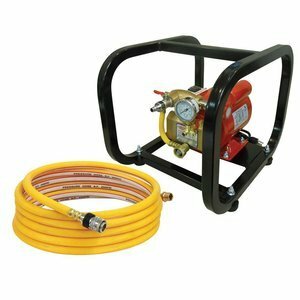 Rice Hydro MTP-1 Manual Hydrostatic Hand Test Pumps, 1000 PSI, High pressure 1/4" outlet hose, 8 foot length. Designed for testing small diameter water lines, in areas such as landscaping, plumbing, and residential. Unique dual check valve system reduces water bleed-back and user fatigue. Features and Specifications: 3/4" swivel inlet, shut off valve, and rubber grip handle. Dual check valve system prevents water "bleed-back". Less user fatigue, shorter test times. Stainless Steel liquid filled gauge ensures accurate readings. With 3 Gallon Water tank. Weight: 12 pounds, Shipping Dimensions & Weight: 18 x 17 x 15, Shipping Weight: 15 pounds. 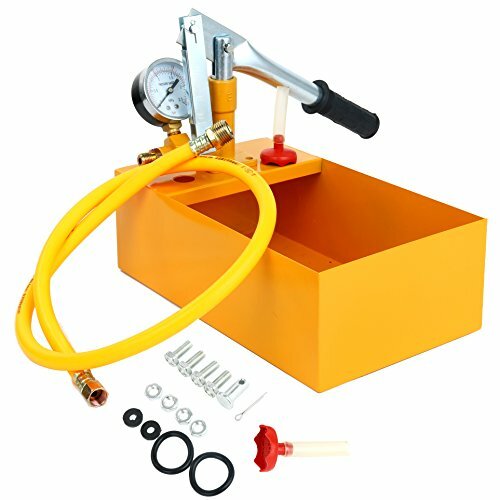 YaeTek Hydraulic Manual Pressure Test Pump Hydro Static 2.5 Mpa 25 Bar & 1/2"
Specifications: Dimension: 29x18x10cm (about 11.6*7.2*4inches) Color: Yellow Aproximately 42inches Rubber Hose with 1.2" Male hose Fitting Metal Handle with Ergonomic Foam Grip 0-2.5 Mpa/25Bar Pressure Gauge How to use it: 1.Connect the water hose to the measured water pipeline (Note: Connect sealed) 2.Fill the measured pipe with water, make air out and turn off the switch 3.Make the tank filled with water lift the rod and then begin to test the pressure 4.Stop pressing when the pressure reach the need 5.After stopping the pressure, if the pressure indicated on the pressure gauge does not drop, you can prove that the pipeline pressure resistance is good, or the measured pipe is leakage. Rice Hydro EL1 Hydrostatic Test Pump, Electric Plunger Pump, 3 GPM up to 300 PSI, pressure testing, 1/2 HP. Hydrostatic Test Pump. The EL1 is a low volume medium pressure hydrostatic test pump. Designed for testing Fire Sprinkler Systems. 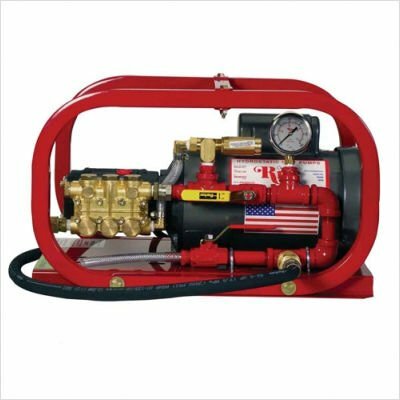 Features and Specifications: 3 GPM up to 300 PSI, 1/2 HP Electric Motor, TEFC, 110/220 Volt, 60 HZ, Automatic Pressure regulator with inlet bypass, Stainless Steel liquid-filled gauge ensures accurate readings, Rugged roll cage construction, protects pump from damage. Pump weight: 58 lbs. Dimensions: 22 x 14 x 14. Shipping weight: 60 pounds. Rice Hydro EL3 Hydrostatic Test Pump, Electric Plunger Pump, 1.5 GPM up to 1500 PSI, pressure testing, 1.5 HP. Hydrostatic Test Pump. 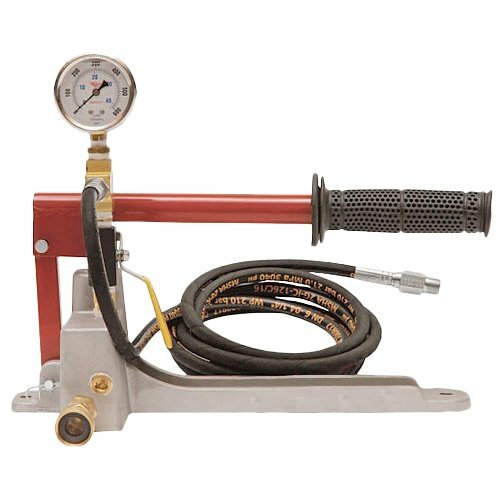 The EL3 is a low volume high pressure hydrostatic test pump designed for testing sprinkler systems, irrigation lines, pressure vessels, plant process piping, and small diameter water lines. 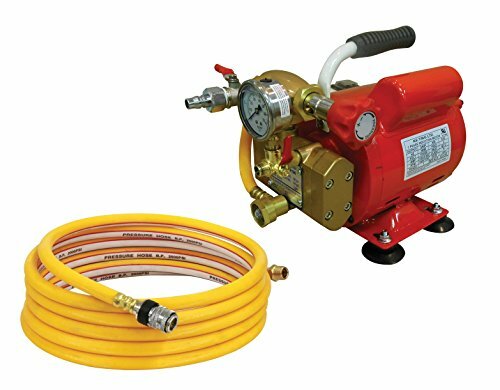 Features and Specifications: 1.5 GPM up to 1500 PSI; 1.5 HP Electric Motor, TEFC, 110/220 Volt, 50/60 HZ; Automatic Pressure regulator with inlet bypass; Stainless Steel liquid-filled gauge ensures accurate reading; Pump weight: 86 pounds; Dimensions: 22 x 14 x 14; Shipping: 88 pounds. 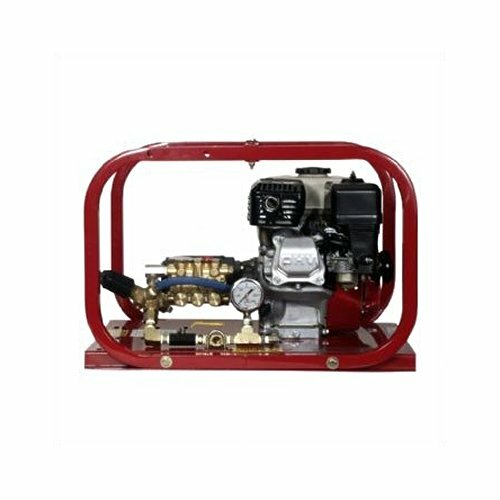 Rice Hydro TRH2 Hydrostatic Test Pump, Plunger Pump, 3 GPM up to 2000 PSI, pressure testing, 4 cycle Honda Engine with Oil Alert, 6.5 HP. Hydrostatic Test Pump. The TRH2 is a medium volume high pressure hydrostatic test pump designed for testing boilers, vessels, process piping, steam and gas lines. Optional wheel and handle kit for portability. 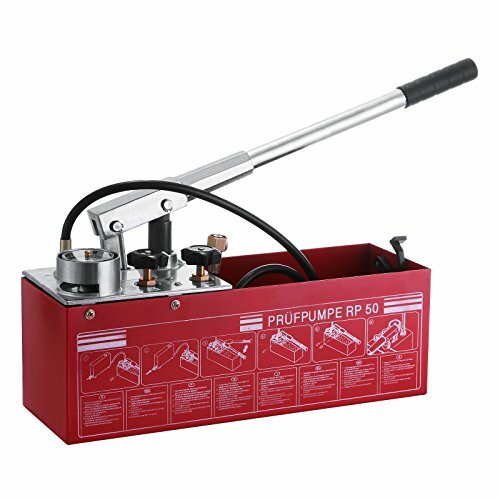 Features and Specifications: 3 GPM up to 2000 PSI; 196 CC 6.5 HP, air-cooled, 4 cycle Honda Engine w/Oil Alert; Automatic Pressure regulator with inlet bypass; Stainless Steel liquid-filled gauge ensures accurate readings; Rugged roll cage construction, protects pump from damage; Weight: 95 pounds; Dimensions: 40 x 26 x 24; Shipping: 110 pounds. Electric Hydrostatic Test Pumps are designed for pressure testing water systems such as water meters, plumbing lines, pressure vessels, solar systems and sprinkler systems, in both residential and commercial buildings. The output pressure is easily adjusted by turning a knob and watching the attached gauge. A built-in bypass allows for automatic water recirculation once the set pressure is reached. The hose-to-pump connection features a quick disconnect with built-in check valve, which allows for convenient setup and portability. Durable pump has stainless steel piston and brass cylinder for long pump life. Replacement seal kits available. Replacement seal kits available to sustain pump efficiency. Rice Hydro DPH-8 Hydrostatic Test Pump, Triple Diaphragm Pump, 32 GPM up to 300 PSI, pressure testing, pressure testing, 4 cycle Honda Engine, with oil alert. Hydrostatic Test Pump. The DPH-8 is a large volume low pressure hydrostatic test pump. Designed to allow handling of up to a 10% chlorine solution, recommended for testing water lines up to 96" in diameter. 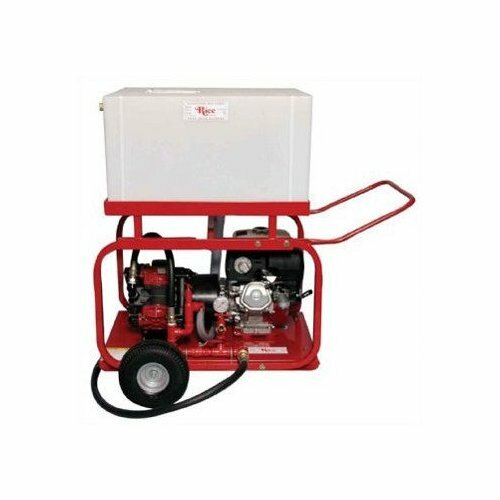 Features and Specifications: 32 GPM up to 300 PSI; 270 CC 9 HP, air-cooled, 4 cycle Honda Engine, with oil alert; Automatic Pressure regulator with inlet bypass; Stainless Steel liquid-filled gauge ensures accurate readings; Rugged roll cage construction, protects pump from damage; Weight: 188 pounds; Dimensions: 40 x 28 x 28; Shipping: 208 pounds. Looking for more Hydrostatic Test Water Pump similar ideas? Try to explore these searches: Miracle Antioxidant Vitamins, Moog Suspension Stabilizer Bar, and Irish Caffeine Free Tea.